Eight weeks before Danelle Buchman’s baby was due, an artery ruptured in her uterus, which nearly killed her and her child. Delivered by emergency C-section in 2010, her newborn daughter, Avery, spent one month in intensive care. Buchman survived only after an immediate hysterectomy. When she tried to return to a PR job she loved and had won rave performance reviews for at a Maryland nonprofit a few weeks later, Buchman’s employer first demoted her and cut her salary by a third. Then it fired her. It was all perfectly legal. Buchman, 37, who lives in Clarksville, was not covered by the federal Family Medical Leave Act. And a new Labor Department survey shows that neither is 40 percent of the U.S. workforce. Advocates, including President Obama, hailed the hard-won law’s 20th anniversary this week, saying it has helped an estimated 100 million workers take up to 12 weeks of unpaid leave annually to handle health issues without losing their jobs. International studies have found that it is the only “family-friendly” policy in the United States and that other countries have more. But Buchman wanted to get the word out that the policy isn’t so family friendly after all. The law, which took nine years to pass, was designed to acknowledge that workers and their families get sick, workers have babies and workers need to care for aging parents. The business community insisted that the leave be unpaid as a check on employee misuse, said Marc Freedman, of the U.S. Chamber of Commerce. It does not apply to companies with 50 or fewer employees, part-time workers, those who have worked for a company for less than a year or those who have taken unpaid medical leave within the previous two years. It also does not cover workers who care for grandparents or extended family members. In medical emergencies, the fate of those workers is left entirely up to individual managers and companies. Some companies that are not forced to comply with the leave act, such as the Cook Ross consulting company in Silver Spring, match and exceed the federal law. Others don’t. And even when workers are covered by the law, they are sometimes penalized for taking advantage of it, as court cases and 5,375 labor violations show. Workers covered by the law have been fired for asking for leave to care for chronically ill parents or to accompany a dying father to the hospital. ordered bed rest during her pregnancy. Her employer, the former E. Spire Communications of Annapolis, maintained that she had used up all her medical leave before the baby’s birth. She sued in federal court and lost. Daniel Coleman sued his employer, the Maryland Court of Appeals, contending that he was fired in 2007 for asking for 10 days of medical leave to treat his hypertension and diabetes.The U.S. Supreme Court decided 5 to 4 last year that states are immune from family leave act lawsuits. However, a recent Virginia case set a new precedent that public officials could be held accountable as individuals for violations. Patricia Weth, 48, had worked for the Arlington County treasurer for six years. On the day in 2010 that she returned from a seven-week leave in which she underwent surgery and chemotherapy for uterine and ovarian cancer, her boss fired her. She sued. Although she lost, her case could help others who are fired by public officials. Talk to the nearly 500 members of the Tysons Corner New Moms MeetUp group (TYMOMS) in Virginia about their parental leave and you get 500 different stories. Some mothers, like about half the workforce, had some paid time off. Others had leave without pay. Still others were entitled to no leave at all. Some were laid off while pregnant. Some quit. Some stopped breast-feeding early. And all worried not only about finances but also about the research showing how critical the first year is for an infant to bond with a parent and breast-feed to develop physically and emotionally. 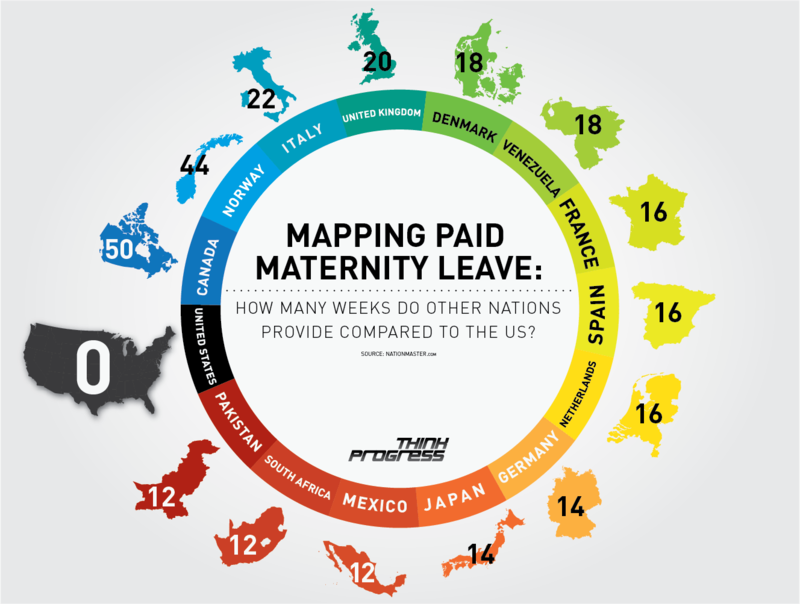 The United States is one of only three countries that do not mandate paid parental leave out of 177 nations, according to researchers at McGill and Harvard universities. The other two are Papua New Guinea and Swaziland. In 2010, when Buchman was rushed to the hospital, each of the law’s limitations applied. Buchman had had her first child just 14 months before Avery’s delivery and had worked part time for a little under a year for the Maryland affiliate of the nonprofit Susan G. Komen for the Cure. Some small businesses comply with the law anyway, saying that it’s good for productivity and the bottom line to have a “compassionate, caring culture.” Cook Ross in Silver Spring has only 14 employees but offers more leave than larger companies are required to provide under the law. Cook Ross manages the 13-week leaves it offers by making sure employees are cross-trained so no one person knows only his or her job. Shifting work around is also seen as learning new skills and taking on a new challenge. It has given one employee time off and the ability to work remotely to care for his mother, who has Alzheimer’s and lives in Upstate New York. It’s given another, who was fired from a firm after a stroke, the ability to work flexibly and care for his health. Amilcar took time to bond with her newly adopted child two years ago. “It’s just an amazing gift,” she said.